Get to-dos into your calendar/mail to-do list quickly (was FlexTD). Is there a better alternative to FlexCal? Is FlexCal really the best app in System category? 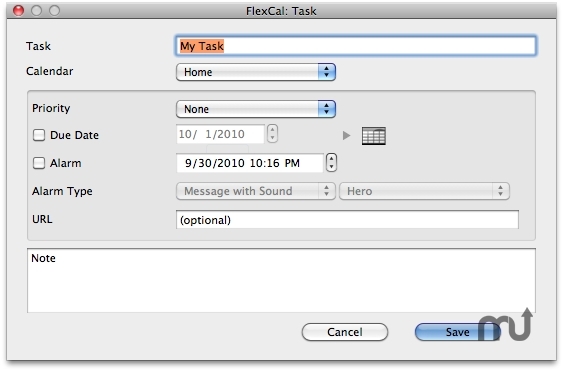 Will FlexCal work good on macOS 10.13.4? FlexCal is a simple way to get your tasks or events into your calendar quickly. Simply hit a hotkey (that you define) and a quick entry window pops up - from within any application. The first window is a task entry window. Hit the hotkey again and an event entry window appears. Type in your task or event, hit return and instantly the item is added to your calendar. FlexCal needs a rating. Be the first to rate this app and get the discussion started!